Experience Hendrix, L.L.C., the family owned company devoted to preserving the legacy of the late guitar-great Jimi Hendrix, announced the line-up for its all-star musical tribute to be held on Saturday, September 7 as part of San Diego's popular Street Scene festival. Celebrating its 19th Anniversary, Street Scene is widely recognized as "the best musical event in California." The three-day event, held September 6-8 features over 100 bands on 12 stages, including the sounds of rock, R&B, rap, electronica, funk, reggae, ska, hip-hop, blues, jazz, salsa, mambo, and Zydeco. With an expected audience in excess of 100,000 and the addition of the Jimi Hendrix All-Star Tribute, this year's event is sure to be a memorable affair. Onsite throughout the three-day event will be the Jimi Hendrix Red House Tour with it's psychedelic emblazoned 18-wheeler big rig. This critically acclaimed event has toured non-stop throughout North America this year stopping at events with a combined audience in excess of 5 million people. Featuring a newly constructed expandable, 53-foot show trailer, the new settings give fans the perfect opportunity to experience the life, music and legacy of the world's greatest guitarist. 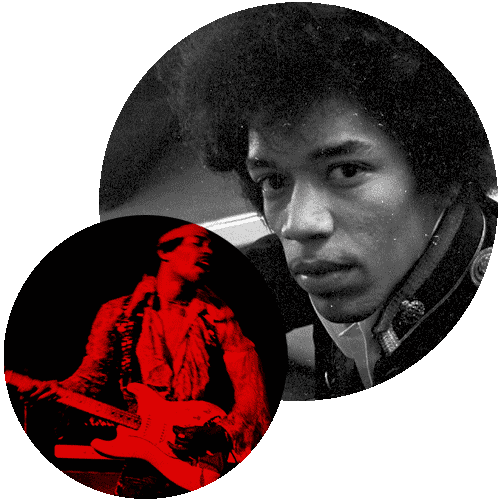 Visitors to this free exhibition are encouraged to follow a timeline of Jimi Hendrix's entire life with an emphasis on the major recordings he completed during his short but prolific career. The attractive visual displays include three rotating audio/visual presentations, one being a big screen 12-minute performance piece featuring a newly remastered Dolby 5.1 Surround Sound presentation of Hendrix's last major concert appearance at the Isle Of Wight in August 1970. Following on the heels of last year's hugely successful Jimi Hendrix Tribute Concert at the 18th Annual Street Scene Festival, this year's expanded line-up will include some of the biggest names in rock music paying tribute to Jimi Hendrix. Headlining this year's event will be original Band Of Gypsy's member Billy Cox and Buddy Miles, original Experience drummer Mitch Mitchell plus special performances featuring Chris Layton and Tommy Shannon of Double Trouble, Dave Navarro, Bernard Allison, Andy Aledort, Robert Randolph, Eric Gales, Doyle Bramhall II, Res, Living Colour, Los Lobos' David Hidalgo and Cesar Rojas, ex-Guns `N' Roses lead guitarist Slash, Ace Frehley of KISS fame, Matchbox 20's Kyle Cook, Indigenous, Kenny Wayne Shepherd, Mick Taylor, plus Stephen Stills. For additional information on Street Scene or to order tickets contact the festival hotline at 1-800-260-9985 or online at http://www.street-scene.com. Sorry, no images from this tour are currently available. Please check back soon as we are adding new photos all the time.